Canaries are known for their beauty and their song and have been kept as pets since the 1400s. Colour - Yellow, red-orange, white, pink, and many shades of brown. The canary as a companion has deep roots in the American psyche, perhaps due to its contribution as a noxious gas detector in the coal mines of the 1800s and early 1900s or its use as the model for the feisty yellow cartoon character, Tweety Bird. Whatever the case, the canary has been a favorite among bird keepers for hundreds of years, and has been bred into more than 200 breeds, much like dogs have, each breed prized for a particular skill or appearance. The canary was named for its place of origin, the Canary Islands; the islands were named after the dogs kept by the islands’ residents, more specifically after the Latin designation for dog, canis. The original canary was nothing more than a greenish-colored finch, nothing out of the ordinary – except for its song. Europeans fell in love with the canary’s song, and began importing them in the late 1500s. Eventually, the Europeans began breeding these birds and capitalizing on small mutations, developing canary breeds that hardly resemble each other today, and certainly don’t resemble their wild ancestor. The population trend appears to be stable, and hence the species does not approach the thresholds for Vulnerable under the population trend criterion (>30% decline over ten years or three generations). The population size is very large, and hence does not approach the thresholds for Vulnerable under the population size criterion (<10,000 mature individuals with a continuing decline estimated to be >10% in ten years or three generations, or with a specified population structure). For these reasons the species is evaluated as Least Concern. The breeding population, which is confined to Europe, is estimated to number 20000-100000 breeding pairs, equating to 60000-300000 individuals (BirdLife International 2004). The most commonly kept Canary birds are the American Singer, the Border Fancy, and the Red Factor. The American Singer is a song Canary (well known for singing), the Border Fancy is a type Canary (a popular type), and the Red Factor is a color Canary (well known for color--the more red, the more valuable). Canaries are known for their beauty and their song and have been kept as pets since the 1400s. They are not companion birds and are better admired from afar, but this doesn't make them any less of a great pet. They do spend a lot of time in their cages, so you need an adaquately sized cage with perches on either end to provide them with maximum flying space. If you want a Canary that sings, you will need to find a male. If this is very important to you, you should arrange ahead of time with the breeder to be able to return the bird if it proves to not be a singer. Keep in mind that males sing to attract females, so they should not be kept in pairs. They also don't sing in the summer because it is molting season. We have also heard to not put mirrors in their cages because Canaries are very territorial and they may see this "second bird" as a threat. canaries are pretty hardy and can be kept at room temperature. Keep the cage away from draughts, air conditioners and windows that receive direct sunlight (the cage and canary can get overheated). cover the cage at night, at the time the sun goes down (unless you live in an area with extremely long nights or days such as the far north). Canaries need their rest and will do best if given a light/dark cycle that approximates natural changes. Keeping them up late with artificial light is not healthy for them. provide toys, but place them in the cage in such a way as they do not obstruct flight space. Your canary might enjoy swings, mirrors, bells, and hanging wooden or acrylic toys. Though it is primarily a solitary species, a canary in the midst of breeding season will want to mate, and though some canaries will show little interest in anything but breeding, some do become fiercely attached to a mate. As for breeding behavior, canaries are like clocks that use the sun to show them when it’s time to nest. This natural behavior can be disadvantageous for the house canary, whose life is filled with artificial lighting. 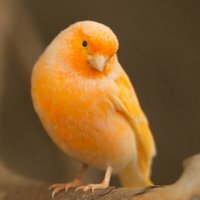 If you prefer to breed your canaries indoors, choose a bright area. Sufficient daylight is important for their health and well-being, as well as to bring them into breeding condition when it's that time. The cage should be a minimum of about 24 x 16 x 16 inches (or even bigger for the larger canary breeds, such as the Yorkshire Canary). In addition to the normal cage accessories, such as perches, seed and water dishes, and sand or newspaper to cover the cage floor, there should be a device for making it easy to the canaries to build the nest, and a crib that contains hemp or burlap. Canary nest cups are available at the pet store and readily accepted by the canaries. However, do try to stay away from the "flimsy" ones that fall down easily. There is nothing sadder than broken fertile eggs at the bottom of the cage or the aviary due to that happening. The flimsy ones don't last long either. You may think you are saving money, but you really aren't - due to the loss of eggs or chicks and constant replacement cost of these cups. Of course, if you are a little handy and find ways to attach them securely - then why not. Whenever you plan to breed, you should be sure to have enough room in your cages for the little birds even after they are grown to be independent. Housing for any bird is an important factor for keeping it healthy, but proper housing for the canary is essential for keeping it happy and singing. Also, each canary should have its own cage, or the result could be deadly. Canaries are territorial and do not like to be housed together. Canaries can live more than 14 years with proper care. Get the largest cage possible, that allows for room for flight (a pet canary should never have his or her wings clipped and should be able to fly in the cage for exercise). "Flight" type cages are the best (home built or commercial) since they are designed to provide room to move. Remember that a long cage is better than a tall narrow one (the height is not all that important). Try to get a cage at least 24 inches long. Watch the spacing between bars - no more than 1/2 inch. Wire cages are best, wood or bamboo cages are too difficult to keep clean. Perches: wood perches of varied diameter work best (3/8 to 3/4 inches). Some canary keepers alter smooth round perches by scraping them with a saw blade or utility knife, just enough make the surface slightly irregular (easier to grip and the variety may make the perches more comfortable for the canary's feet). Do not use sandpaper perch covers. Males canaries sing better than females, although the canary may not sing as much during a molt. Canaries are susceptible to mite infection, namely: air-sac mites (which are found in the bird’s respiratory system), scaly mites (which show as scaly buildup around the bird’s beak, eyes and/or legs), feather mites and red mites (nocturnal mites that crawl out during the night and feed on the bird’s blood). Mite infection is treatable if caught early on, so be proactive in seeking out treatment as soon as you suspect that your canary might have mites. Canary pox is a virus transmitted by mosquitoes that poses a serious threat to canaries, especially those housed outdoors (which is why many people recommend housing these birds indoors) with higher infection rates occurring during summer months.